CM-TB8 8 Channel Talkback Control Unit With Optional CM-TBT Dual Telephony Card. The CM-TB8 is a powerful and highly flexible self contained communications unit allowing multiple 4-wires and IFBs within a single 1U rack space. 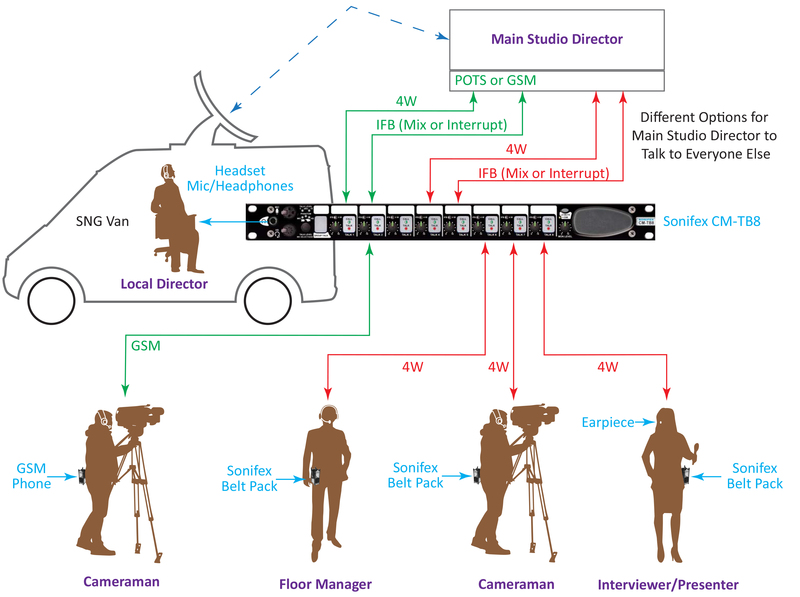 It offers easy connection to any industry standard talkback system including the Sonifex CM-TLL line listen unit plus the CM-CU1 and CM-CU21 commentator units. The CM-TB8 8 Channel Talkback Control Unit is ideal in an OB truck or small studio. The CM-TB8 is a talkback control unit providing 8 channels of 4-wire communication, housed in a 1U rack mount enclosure. The unit has individual connections for both a headset on 5 pin XLR and microphone/headphones on XLR/stereo TRS jack, with the current selection indicated on the front panel. The gain setting for each input type can be individually set between +6dB and +68dB allowing for a wide range of microphone types and +48V phantom power is also available. Small talk level adjustments can be made quickly, using the front panel rotary control with a maximum adjustment range of ±12dB. This adjustment can be disabled if required to stop inadvertent changes. A level limiter automatically adjusts the microphone gain if the signal level exceeds a preset level, and the current talk level is indicated on the front panel when it exceeds 0dB and +8dB. A separate output on the rear panel provides a balanced, gain adjusted and level limited microphone signal on 3 pin XLR. Each channel can be set to either 4-Wire or Interruptible Foldback operation. In 4-Wire mode the 4-Wire input signal is routed to the monitor channel (headphones/headset & loudspeaker) at the level set by the monitor level potentiometer. When the TALK button is pressed, the microphone signal is routed to the rear panel talkback output connector, and the level of the feed to the loudspeaker is reduced to the level preset by the dim potentiometer. When in IFB mode, the channel’s own 4-Wire input, or one of two external IFB inputs, is routed to the talkback output connector and can be selected as the interruptible signal. It is also possible to configure each channel so that the input signal is mixed with the microphone input rather than being interrupted by it. When a channel’s TALK button is active, the level of the signal routed to the loudspeaker is automatically reduced by a preset amount, which ranges between full on and off. The TALK button also acts as a call indicator. When the signal level on the 4-Wire input of an inactive channel is above -12dB, the talk button illuminates green. The TALK and GROUP TALK buttons all have a momentary action that will automatically latch on if they are briefly pressed. The group talk function allows a group of preselected channels to be activated simultaneously. The buttons on all activated channels are illuminated as is the GROUP TALK button. Each channel can be included or excluded from group talk function, and by default, all channels are included. Each channel has a separate monitor level control which sets the level of the signal that is mixed with the other active channels. This signal is then fed to both the loudspeaker and headphone monitor channels and its overall level is controlled by the monitor level potentiometer. The loudspeaker has front panel mute and dim attenuation level controls. An external loudspeaker connection on the rear panel provides a level adjusted output and when this output is used, the signal to the internal speaker is muted. The unit has a built in line-up tone generator for easy channel identification and cabling checks. The test-tone generator has 2 modes. In manual mode, tone is routed to a channel when the corresponding TALK button is pressed. In auto mode, a tone pulse is generated on each channel to uniquely identify it. A rear panel mounted remote output connector provides a ‘tally’ indication of active talk channels and group talk status via open collector driven outputs. Other ‘tally’ outputs indicate the status of the loudspeaker dim and mute controls and also if any of the audio input activated call indications are active. A separate remote input connector provides an additional call input indication on each channel. When an input is activated, the corresponding talk button flashes. Inputs to remotely operate the loudspeaker dim and mute controls are also available. A factory fitted optional telephony card (order CM-TB8T or CM-TB8G respectively) allows up to 2 channels to be connected to a telephone or GSM network. This allows the operator and the talkback users to communicate with a connected caller and both 4-wire and IFB operation is available. The CM-TB8 provides a wide range of user configurable options and there are 6 configuration templates that allow settings to be stored and recalled at a later date. Two of the configuration sets are read only and cannot be changed. The other four can be used to store customised settings. This allows the unit to be preconfigured for a range of user scenarios which can be instantly recalled. The unit’s Ethernet port allows configuration settings to be modified using the built-in web server and an on-board configuration mode allows several of the configuration options to be changed without the need of a PC. The CM-TB8 talkback control unit is powered from a universal mains input between 85-264V AC at 47-63Hz. 8 Channel talkback control unit in a 1U rack mount package. Separate microphone and headset inputs with phantom power and individual gain settings. Microphone talk level can be instantly adjusted or preset. Talk level LEDs and built-in limiter. Interruptible Foldback and direct 4-Wire operation selectable on each channel with optional talkback-microphone mix function. 2 external IFB (Interruptible Foldback) inputs available to each channel. Optional telephone hybrid or GSM ports allow direct connection to a telephone line for remote communications. Individual monitor level control for each channel. Microphone output feed which is gain adjusted & level limited. Ethernet connection for remote configuration with built-in web server. 6 stored configuration templates with 4 user editable sets. Front panel loudspeaker with separate feed for an external loudspeaker. Loudspeaker mute and dim controls, also available on remote input. Remote ‘tally’ outputs indicating when each channel is active. Remote inputs providing a call indication on each channel. Built in tone generator for channel identification.